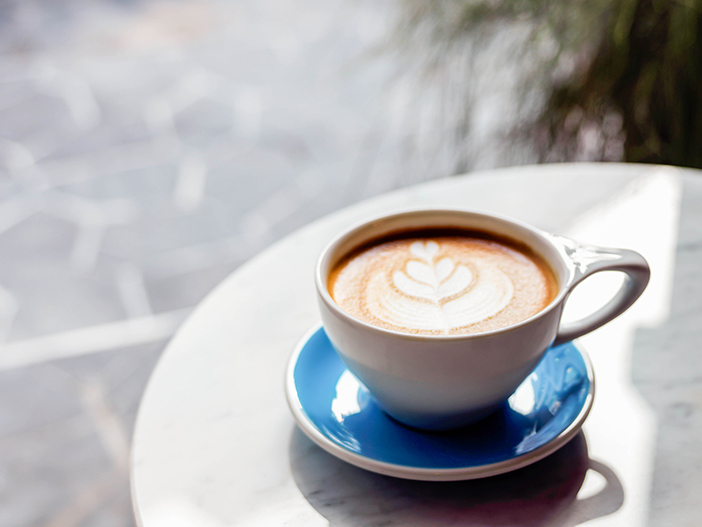 The Korea Tourism Organisation has selected top 5 hot cafes in Seoul. The entirety of Café D’ssent is white with small accents of color, clearly demonstrating the essence of the minimalism interior design style. The all-white design can appear quite bland, but it serves to focus the mind on the music and the scent of coffee filling the space. 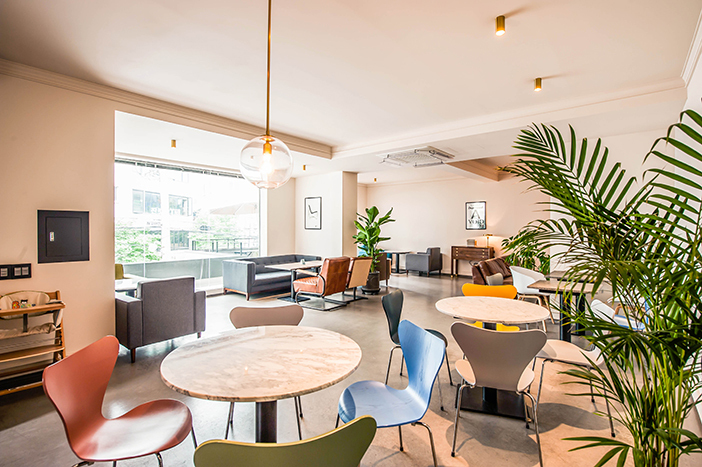 The café is located near Dosan Park, a green oasis within the urban landscape. 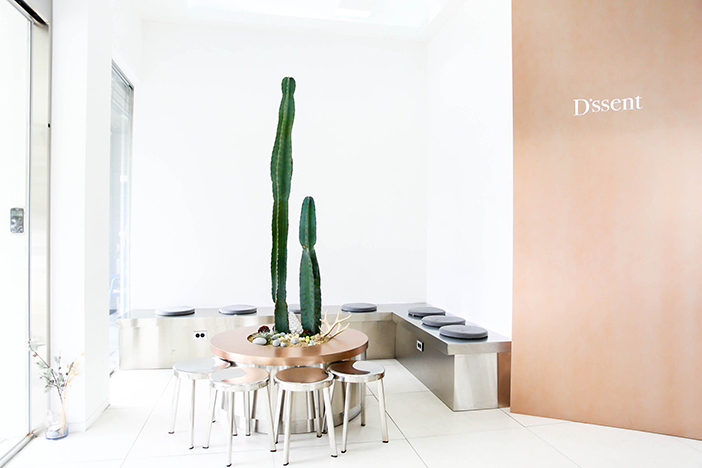 D’ssent is the perfect place to stop by either before or after a stroll in the park. 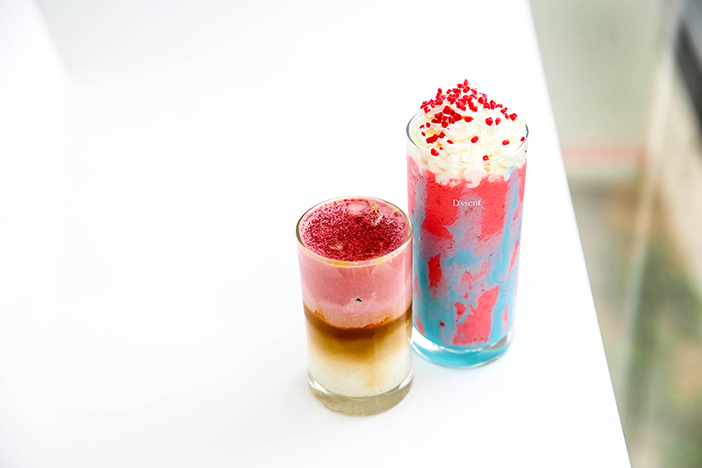 D’ssent’s main drinks are the one-of-a-kind oz, a pink and blue strawberry smoothie, and D’ssent latte, topped with sweet cream colored red with beets. Another popular order in summer is the cool and refreshing cold brew. The house cold brew is canned and is served with an ice ball in a cup. All the drinks go great with the tiramisu made in-house. ☞ Directions: Apgujeong Station (Seoul Subway Line 3), Exit 3. Walk approx. 10min. Avec El is French for “with him,” and the sweet interior decorated with lovely items is just as romantic as the name implies. 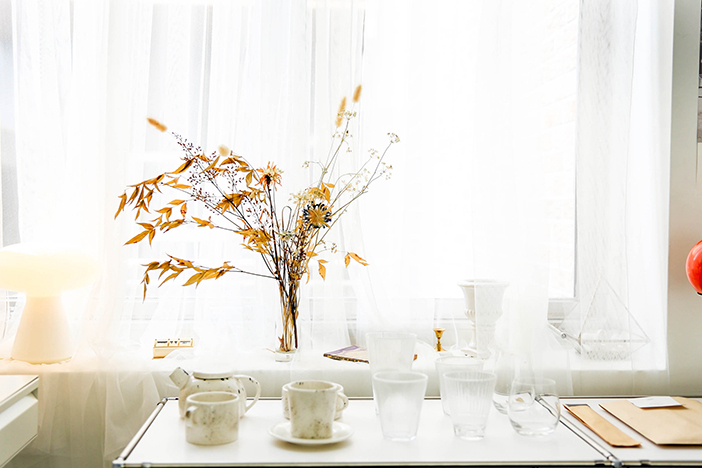 One’s heart can’t help but be moved by the items of daily life that might decorate any home, from the hand-made candles to the air fresheners and tea cups. All of the items on display within the café are available for purchase. Despite being a rather small café, each table has plenty of space to enjoy a comfortable and laid-back time. The focus at Avec El is on apples; a plate of freshly sliced apple comes with each order. The ringo latte which can only be found here is a perfect blend of apple and milk. If you find yourself in need of some caffeine, we recommend the macha aurora, a green tea latte with a shot of espresso added for a kick. During the hot summer months, many people order summer forest toast and mango soda. 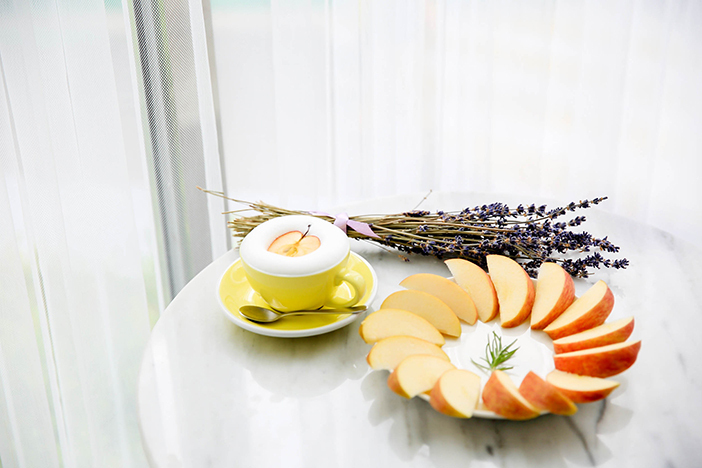 Summer forest toast, a specialty of Avec El, features jam made from Jeju green tea powder and fresh peaches, red bean paste, and gourmet butter for three tastes in one. The earl grey chiffon cake is also extremely popular, releasing a strong scent of tea that is sure to boost one’s mood for the entire day. ☞ Directions: Seoul Station (Seoul Subway Line 1, 4, Airport Railroad), Exit 11. Walk approx. 15min. 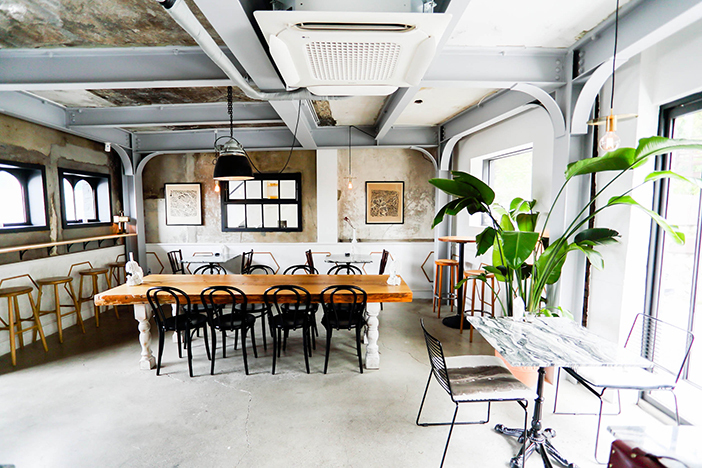 Oriole is a famous rooftop café operated by singer Jung Yup. Located on a high point of the Haebangchon ridge, Oriole offers views of Haebangchon and the Itaewon area, as well as Namsan Seoul Tower. 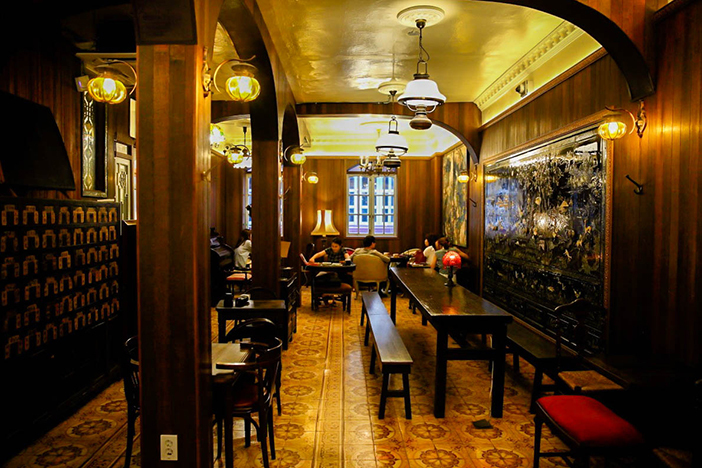 Oriole operates as a café during the day, but transforms into a dining space and bar after 6 pm. There is nothing quite like having a cold beer while taking in the view. You might want to arrive early if you’re planning on enjoying the nightscape, as they do not take reservations. The menu of Oriole includes standard coffee options. Desserts include tiramisu, made with mascarpone cream cheese, and sweet vanilla and raspberry cream-filled dacquoise. While there aren’t many choices, the dishes are made to perfection, able to remove one’s fatigue after just one bite. Before leaving Oriole, there is one photo zone you can’t pass up! The café space on the first floor features a miniature two-person table set on display by the window. Many people enjoy taking pictures of this small setting placed before the backdrop of Haebangchon. ☞ Directions: Noksapyeong Station (Seoul Subway Line 6). Take a taxi for approx. 6min. ☞ Directions: Hannam Station (Seoul Subway Gyeongui-jungang Line), Exit 1. Walk approx. 14min. Coffee Hanyakbang is located in an alley in Euljiro that is so narrow that you would have to close your umbrella to enter on a rainy day. Ignore the dreary vibes given off by the alleyway and the old wooden door; they only serve to protect the wonderful world that hides within Coffee Hanyakbang. The interior of this café is decorated with mother-of-pearl and lacquer ware items and antique roasting tools. Music is continuously played from LP records to complete the vintage aura. 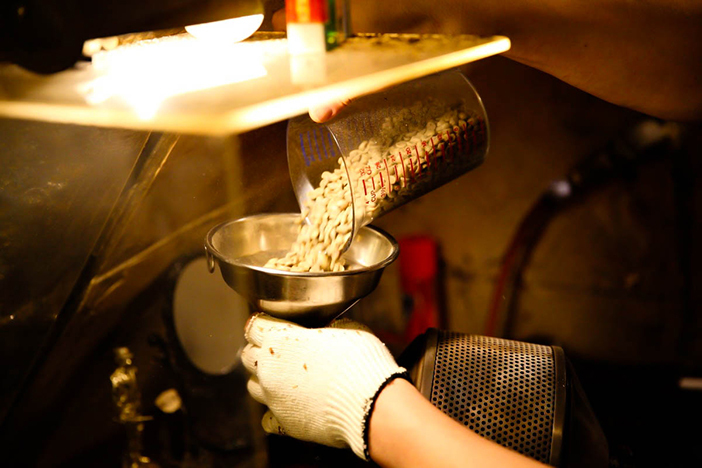 Coffee Hanyakbang roasts their coffee beans daily through the direct contact method, something that is not seen often in other cafés. Through the direct contact roasting, the beans take on a smoky flavor that translates into the coffee grounds. Because of the strong flavor and smell, filter coffee is a must-try when visiting Coffee Hanyakbang! However, if you do not enjoy drinking coffee, the café also has raspberry, grapefruit-lemon, and grapefruit teas made in-house, as well as house-made raspberry yoghurt. The owners of Coffee Hanyakbang also operate Hyemindang, the dessert shop just across the alleyway. ☞ Directions: Euljiro 3(sam)-ga Station (Seoul Subway Line 2, 3), Exit 1. Walk approx. 5min.